The younger Charites Pandaisia (Feasting), carrying a tray of ripe fruit and a myrtle(?) 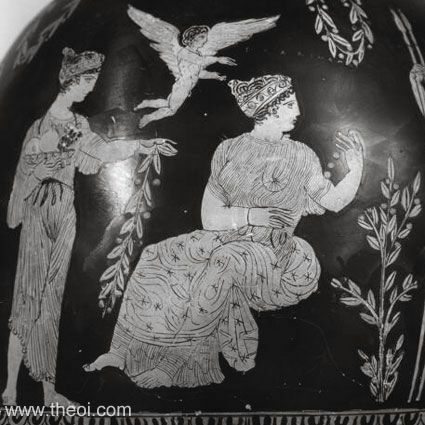 frond, and Eudaimonia (Happiness), seated holding a necklace, are accompanied by Eros the winged god of love. Other figures in the scene (not shown) include Aphrodite, Hygeia (Health) and Polycles. The figures are all labelled by the vase painter.